What better way to start 2019 than with some excellent University of Waterloo contest results. 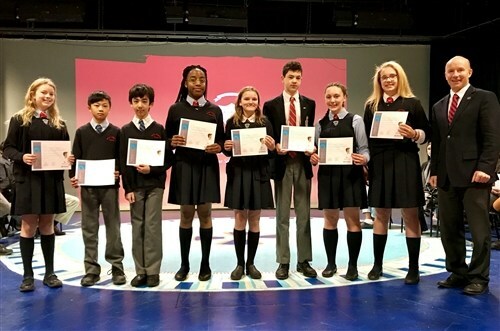 During the early weeks of November, every student in Grades 7, 8, and 9 rolled up their sleeves and turned on their laptops or tablets to take the University of Waterloo’s Beaver Computing Contest. This 45-minute competition, consisting of 15 logic problems, was completed in Mr. Hollett’s, Mr. Alguire’s and Mr. Campbell’s computer classes. Congratulations to all competition winners! We look forward to continued math enrichment in 2019 including our next Dalhousie University Math Circles seminar on Wednesday, January 16th. Interested students in the Junior School can sign up in my classroom. Achievements like this make parents so proud! We find that most parents of King's-Edgehill students are happy to help out whenever they can and are eager to answer any questions prospective parents might have. Let us know you'd like to connect with a current KES Parent!